The second DFW location of Flix Brewhouse is underway with a concept that combines the latest Hollywood productions, brewed on-premises craft beer and delicious food–all served in the theater. 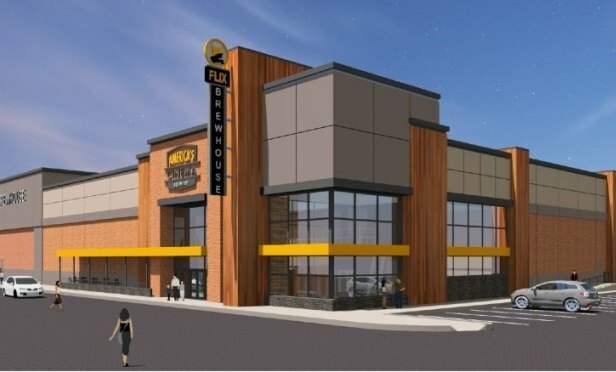 A Flix Brewhouse will be located at the northeast corner of Highway 287 and East Broad. MANSFIELD, TX—On the heels of its first DFW location, Flix Brewhouse is back for more, this time in a 35,000-square-foot location at The Shops at Broad in the Fort Worth market. The theater will be located at the northeast corner of US Highway 287 and East Broad Street. A Flix Brewhouse at Main Marketplace in Little Elm announced last year is scheduled to open in the spring of 2018. The Flix Brewhouse concept combines the latest Hollywood productions, brewed on-premises craft beer and food–all served in the theater. Flix differs from other dine-in theater concepts as the only first-run cinema that is also a fully functioning craft brewery. Venture Commercial Real Estate’s Chris Corbin represented the Round Rock, TX-based dine-in movie theater company in securing the Mansfield site. Andrew Lehner with CBRE represented the landlord. “We are proud to have assisted Flix Brewhouse in finding the right site in Little Elm for its DFW market debut and now our focus is on expanding into Mansfield,” said Corbin, a senior vice president with Venture. Unique features of Flix include auditoriums equipped with parabolic screens, digital audio and video, including Dolby Atmos immersive sound, extra wide plush seating and an EasyGlider tabletop console. Viewers enjoy in-theater service from a complete cooked-to-order menu tailored to local tastes and a dozen signature beers brewed on-premises in a seven-barrel brewery, as well as up to an additional 30 regional and local craft beers. The traffic counts are a minimum of 30,000 cars per day at the intersection of Highway 287 and East Broad Street, GlobeSt.com learns. The Flix Brewhouse concept was created in 2011. Flix currently has locations operating in Albuquerque, Carmel, IN, Des Moines and Round Rock, TX, with construction underway in Chandler, AZ and Madison, WI in addition to Mansfield and Little Elm.